Our pantry is out of control. Jim, a.k.a., Mr. Organization, gives me a regular food inventory in an effort to head off my food buying tendencies. If I’m shopping and I can’t remember whether we have a certain item, I’ll buy another one just in case. Those duplicates have spilled out of the pantry and into other areas of the kitchen. I admit that I’m a little obsessed with keeping a “well-stocked” kitchen. Do you remember that large container of white beans I mentioned in my last post for White Bean and Chicken Chili? I only used half of the beans in that recipe. Contrary to what Mr. O. might think, I do make an effort to keep him happy when things in the kitchen get out of control. So, rather than finding a home in the pantry for another container of beans, I figured that I’d better use them. Being in somewhat of a soup mood the last couple of weeks, I thought a recipe with white beans as the star of the show was the way to go. I grabbed some bacon, shallots, and chicken stock and I was on my way to making a fantastic white bean soup. I added just the slightest bit of heavy cream to give it a rich and creamy texture. 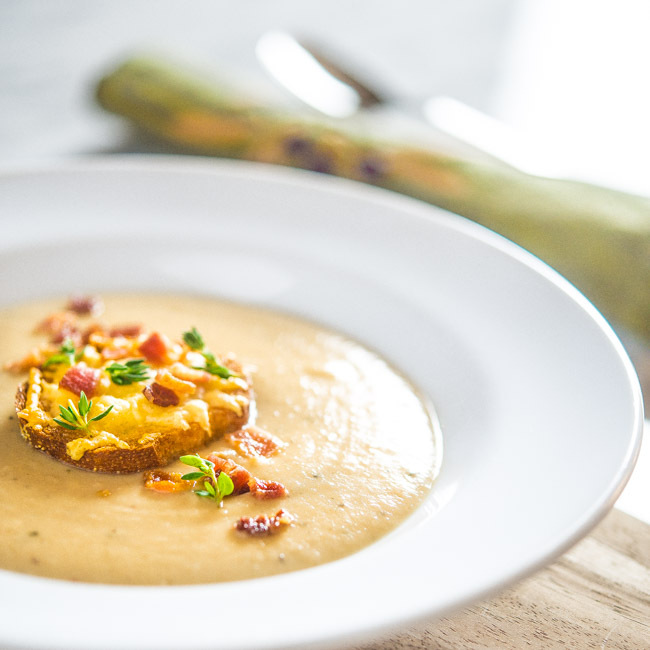 To finish the recipe, I topped each bowl with a Parmesan crouton along with some crumbled bacon and thyme leaves. Preheat oven to 400 degrees. Brush bread with olive oil and top with cheese. Place on a baking sheet and bake for 8 to 10 minutes until cheese is melted and bread is golden brown. 1. If using a pressure cooker, place beans and 8 cups water in cooker. Cook at high pressure for 45 minutes. 2. To cook on the stovetop, rinse and soak beans in 6 cups water for 6 to 8 hours. Drain water and rinse. Place beans in a large stock pot and add 8 cups fresh water. Bring to a boil, reduce heat, cover, and simmer for 60 to 90 minutes or until beans are tender. Remove from heat, drain, and transfer to a bowl. 3. Brown bacon in stock pot or Dutch oven. Remove and reserve bacon. Add 1 tablespoon olive oil to pot. Transfer shallots to pot and saute for 2 to 3 minutes. Add garlic and thyme and continue sauteing for 1 to 2 minutes. 4. Add chicken stock, salt, pepper, and bay leaf to pot. Bring to boil, reduce heat and simmer for 10 minutes. Add beans to the pot, stir to combine, and continue simmering for 15 to 20 minutes, stirring regularly. Remove from heat. 5. Remove bay leaf from pot. Using an immersion blender, blender, or food processor, blend soup until smooth. Add cream, stir until incorporated, and return to cooktop to reheat. Adjust salt and pepper to taste. If soup is too thick, add additional chicken stock.To serve, ladle soup into bowls, top with croutons, and garnish with bacon and thyme leaves. We really are kindred spirits! I had to laugh about buying extra, at the grocery story– just “in case”. For the last two months, I’ve been shopping at home first. It’s amazing how much I cut down on our grocery expenses, too. I am a food hoarder, indeed. I’m very impulsive in what I make, and when I feel inspired I want to know that I have everything on hand. It gets ridiculous, though. LOL I’m SURE I have a can (or five) of these on hand. This is one of my fave soups– healthy and comforting, too. We’re two of a kind, aren’t we, Debby?? Too funny that we share the same obsession. Good think I’ve got Jim to keep me in check! I surprisingly never have made white bean soup before.. but soups are perfect for the rainy weather here in Australia right now – so I must try the recipe out Bill. Looks so creamy, hearty and flavoursome! Thank you, Thalia! I hope you enjoy it! What a spectacular presentation for soup Bill. I adore white bean soup and you’ve made this one extraordinarily special. Thank you so much, Sam! I hope you all have a great Valentine’s Day as well! The only thing I ever use my pressure cooker for is beef stew. So happy to have found another use for it with this simple and delicious recipe! It’s such a timesaver, Mona. Thanks so much for dropping by. Hope you have a great weekend! Perfect winter dish!! Thank you! Beautifully presented, too. Thanks you so much, Susan! I really appreciate your visit!